Strýtan is a place we can rank in world top 10 diving sites list, because this thermal chimney is just like nothing else in this world. It´s simple one of its kind. Strýtan is a thermal chimney build up from a hot water spring on the bottom of 70 meters, rising like a tower up to about 15 meters depth. Divers diving there can see hot water rising up from it all over it and you can even feel the warmth. Strýtan is a place where you can see all kinds of sea life, expecially the small animals hiding in the warmer water. But often there are dozens, or even hundreds of Cods swimming up and down the thermal chimney. 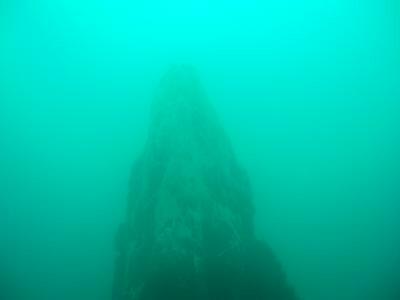 Please go to our tour page or contact us if you wish to go diving in Strýtan. The Akureyri weekend tour goes to both Silfra and Strýtan. Strýtan is beautiful all year around. Please go to our photo gallery to see more pictures from Strýtan.